Landfill drop off: Tacoma residents and businesses in Tacoma may dispose of undecorated and unflocked Christmas trees for free by bringing them to the Tacoma Landfill between 8 a.m. and 6 p.m. Jan. 2, through Monday, Jan. 20. Curbside collection: The City will only collect undecorated and unflocked Christmas trees that have been cut and placed inside brown yard waste containers with lids closed flat. Decorated or flocked Christmas trees cannot be recycled and must go in the garbage, and Christmas trees left next to containers will not be collected. Customers with specific questions about Christmas tree recycling may call 3-1-1 or (253) 591-5543. Whats the rush? After Christmas people tend to stop watering their tree. Check out this video to see the difference between a wet vs.dry tree fire. Incident Location: 2542 S. Cushman St. Narrative: At 5:39 pm, Firefighters from stations 1,2,4,9,12,13 and 17 responded to a reported house fire. The first arriving company found smoke showing from the first floor of the approximately 2,200 square foot two-story house. Crews made a quick interior attack and knocked the fire down that had started in the living room area. One occupant was able to escape without harm and there were no injuries to report. The cause of the fire was an electrical short in the wiring for a floor lamp resulting in an estimated $40,000 damage to the building and its contents. Incident Location: 2076 E. 56th St. 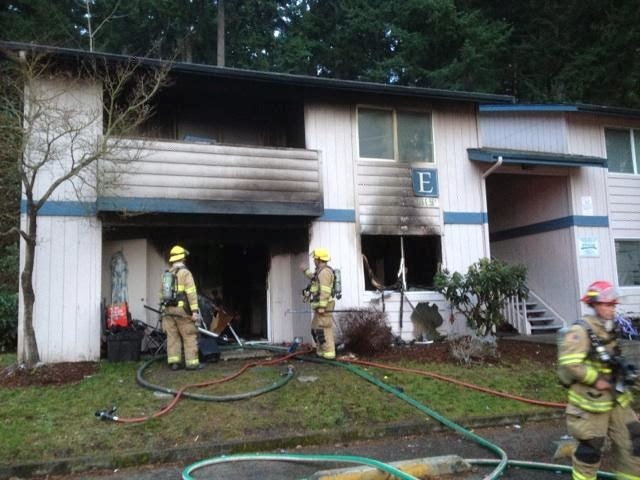 Narrative: At 3:21 pm, Firefighters from stations 2,8,9,10,11,12,17 responded to a reported apartment fire. The first arriving company found heavy smoke and flames showing from a ground floor apartment of the approximately 4,000 square foot four-plex. Crews attacked the fire with handlines and searched the apartment of origin and unit above to confirm no one was trapped in the building. All occupants were able to escape safely and their were no injuries to report. The cause of the fire was unattended cooking resulting in an estimated $38,800 dollars damage to the apartment of origin and $8,000 to the second floor unit directly above. Relocation assistance was requested from the Red Cross for two families displaced in the blaze.